Here’s what’s up in the world of TV for Thursday, June 11. All times are Eastern. 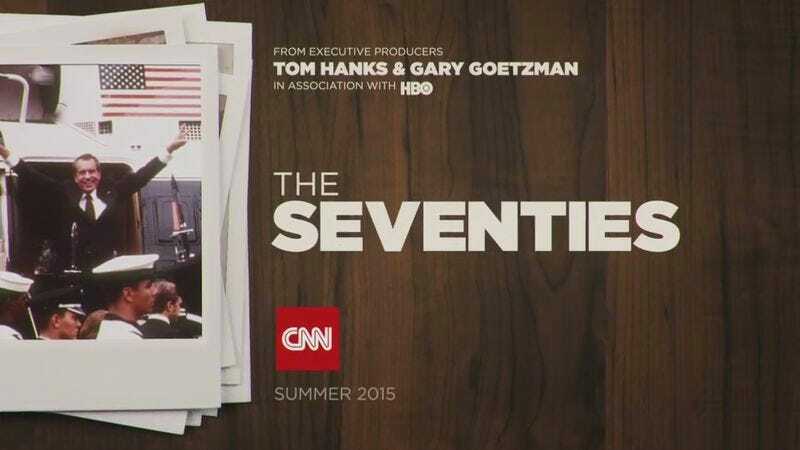 The Seventies (CNN, 9 p.m.): After earning positive buzz with its exploration of the 1960s, CNN applies the same docuseries approach to an era that’s not colored by quite as much nostalgia: The 1970s. This eight-part series will examine topics like the Vietnam War, Watergate, the Iran Hostage Crisis, the sexual revolution, terrorism, music, and more. But first up the premiere focuses on television of 1970s, which should be of note for historically-minded TV Club fans. All In The Family, Monday Night Football, Happy Days, Saturday Night Live, and Roots are just a few of the shows set to be discussed as the episode examines the way TV either embraced cultural change or provided an escape from it. Like all CNN shows, The Seventies is best enjoyed in bell bottoms and/or on acid. Aquarius (NBC, 9 p.m.): For those who prefer to keep their nostalgia firmly focused on the 1960s, there’s always Aquarius. Although the show hasn’t lived up to its potential so far, Gwen Ihnat hopes things finally start clicking this week as Hodiak investigates the murder of a corrupt coffee-hut owner. Sounds like it will take a latte work to solve that one. Wayward Pines (Fox, 9 p.m.): Wayward Pines trades more in mysteries than answers, but this midseason episode might finally start offering up the latter. According to TV Guide, “Ethan ventures outside of Wayward Pines and is shocked by what he discovers.” If it’s a cloning factory, Alex McCown is going to have a field day. Hannibal (NBC, 10 p.m.): Molly Eichel called last week’s premiere “a stellar start to the third season,” but she couldn’t help but feel slightly disappointed by its Will Graham-shaped hole. Thankfully, this week looks particularly Will-focused as the FBI profiler arrivers in Italy to hunt down Hannibal. Futurama (10 a.m.): Fittingly for a show about time travel, it’s immensely confusing to figure out the correct order to watch Futurama because the episodes are listed differently in different places. After bouncing around for a bit, Zack Handlen will now officially be tackling the show in production order aka the Wikipedia order. That means “Kif Gets Knocked Up A Notch” and “Leela’s Homeworld” are up next. Alex McCown weighs in on the rise and fall of the DVD in a brand new For Our Consideration. Though their bonus content once made DVDs essential, the internet has forever changed the way we consume our blooper reels and behind-the-scenes featurettes. Beauty And The Beast (The CW, 8 p.m.): Although it’s hard to believe, this poorly-reviewed show returns for a third season tonight and has in fact already been renewed for a fourth. In the premiere, Vincent (aka the Beast) considers asking Cat (aka Beauty) to marry him. Bones (Fox, 8 p.m.): Bones wraps up its 10th season with a new copycat serial killer who mimics the show’s long-time baddie Christopher Pelant. Elsewhere, Brennan and Booth consider leaving their respective careers, which almost certainly won’t happen as the show has already been renewed for an 11th season. iHeartradio Summer Pool Party (The CW, 9 p.m.): Nicki Minaj, Kelly Clarkson, David Guetta, Echosmith, Chris Brown, and more perform at this Las Vegas concert that presumably takes place at a pool. Nick Jonas hosts, presumably in a bathing suit. The Switch (VH1, 7:30 p.m.): Although it was advertised as a raunchy rom com about a sperm switcheroo, The Switch is actually a sweet, slightly dark character piece with great performances from Jason Bateman and Jennifer Anniston. When it’s not leaning too hard on familiar rom com beats, The Switch is pretty damn charming. Cimarron (TCM, 9:30 p.m.): This 1931 RKO film was the first Western to win the Oscar for Best Picture. Now, however, the story of a young family during the Oklahoma Land Rush of 1889 is regularly cited as one of the most undeserving Oscar winners. 2015 NBA Finals (ABC, 9 p.m.): Matthew Dellavedova stole the show at the last Warriors/Cavaliers match-up. Which player will become a hero in Game 4? And more importantly, which Game Of Thrones character will he look like? Lost (Classic): Myles McNutt and Noel Murray round out their Lost (Classic) coverage as they reach the season three finale, “Though The Looking Glass.” The whole review may or may not be Myles and Noel screaming “WE HAVE TO GO BAAACK!” at one another.